Pour the cream into a large bowl, add sugar and stir well. Set aside. 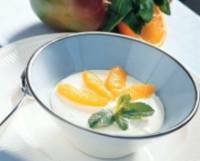 In a seperate bowl mix together the pureed mangoes, vanilla essence and the eggs; combine very well. Place the mango pieces in a large baking dish and spoon a layer of mango puree mixture over it. Pour the cream and sugar mixture evenly and generously over the mango pureed mixture. Sprinkle top of pudding with crushed sugar or castor sugar. In a microwave oven, bake the pudding for 9 to 10 minutes. Let cool completely, then refrigerate. Serve chilled. *Amul Cream is fresh cream and is made in India. It is the equivalent of fresh cream, heavy cream or double cream in other countries. If you do not want to bake the pudding, then add the gelatine to the mango puree mixture after soaking it in warm water for 5 minutes; refrigerate.